VIDEO: Fatal head-on crash aftermath and accident investigation. Thomas Wilcox, 57, of Cary, Illinois has been identified as the victim who was killed in a head-on crash of two vehicles that also involved two additional vehicles. At least three victims required extrication operations to free them from entrapment in a van, a minivan, and a sedan. 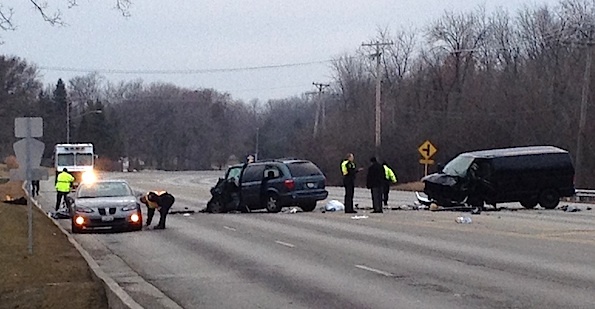 Kildeer police and Lake Zurich firefighter/paramedics responded about 2:39 p.m. Monday to a head-on crash involving a full-size work van and a mini-van with severe front-end damage. Both vehicles were stopped near the middle of Rand Road after the crash. The crash also involved two sedans — one with heavy front-end damage and a Pontiac with minor damage. The Pontiac was facing eastbound in the curb lane of eastbound Rand Road, east of the head-on crash vehicles. The Pontiac appeared to be drivable, but was left at the scene for investigation. The other sedan with heavy front-end damage was facing westbound in the westbound curb lane of Rand Road, west of the head-on crash vehicles. At least five ambulances were called to the scene. Palatine Rural firefighter/paramedics were called to the scene about 2:58 p.m.
Two victims were transported to Advocate Good Shepherd Hospital. Thomas Wilcox was transported to Good Shepherd, and was pronounced dead at the hospital shortly after arrival. Two victims were transported to Northwest Community Hospital. Two other people involved in the crash refused medical treatment. Firefighter/paramedics from Barrington-Countryside, Buffalo Grove, Fox River Grove, Mundelein, Palatine, and Palatine Rural FPD assisted Lake Zurich firefighter/paramedics. Rand Road was closed in both directions between Quentin Road and Cuba Road. The crash scene was cleared about 7:00 p.m. Monday. A-Express Towing was on the scene about 5:05 p.m. The head-on crash vehicles were moved onto flatbed tow trucks, but remained on the scene while police investigated the road and took pictures and measurements where the vehicles were stopped. Accident investigators working a crash scene on Rand Road, just west of Quentin Road. The crash was about 160 yards west of Rand and Quentin intersection.